Christopher R. Heitner, 46, of Spokane, WA, passed away in his home on Oct. 6, 2018 of ALS (Lou Gehrig’s Disease). Chris was born in North Dakota in 1972. He went to Lewis & Clark H.S. in Spokane, and earned an AAS degree in Horticulture from Spokane Community College. He was married to Stephanie Heiter for 14 years, and together they raised two children. 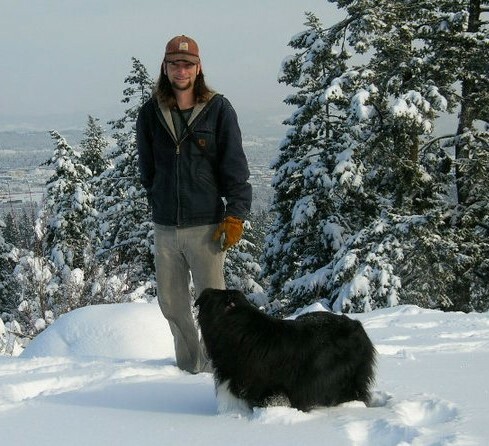 Chris worked for Gonzaga University in the Grounds dept. He was a Master Gardener, as well as a certified arborist. He had a passion for climbing trees and for environmental conservation. In his downtime, he enjoyed gaming, comic books, hiking, and the Marvel & DC Universes. He helped his wife with cat rescue, and loved many a kitten back to health. He will be forever loved and deeply missed by those he leaves behind. He is survived by his spouse Stephanie, sons Jordan and Brent, and sisters Sarah Cornell and Amanda Fleming. In June, Jordan and Brent came to the Herland Forest to look for a place that best matched their dad’s wishes. 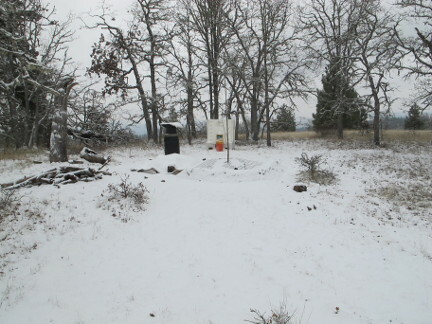 We settled on three possible locations, look pictures, and emailed them to Chris. After Chris selected his preferred spot, we laid down tarps to protect the grass, and dug the grave. Chris passed in early October, and two weeks later, his family and friends gathered to lay his remains to rest. 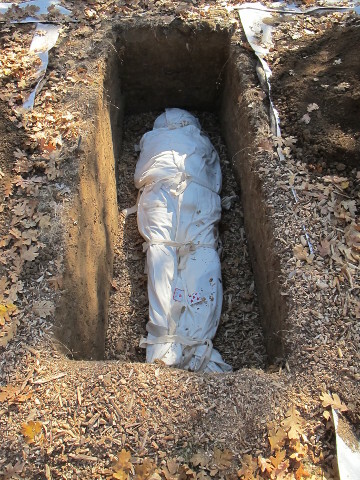 The first step in the burial process is to cover the bottom of the grave with a bed of woodchips. Then the shrouded remains are lowered in to rest on the chips. After everyone had time to say their final good-byes, we started the process of adding the wood chips that would encase Chris’ remains. Wood chips are mostly carbon with very little nitrogen, so by themselves, they are very slow to self-compost. But human remains contain lots of nitrogen, and the combination of wood chips and remains creates a balance that will compost naturally. 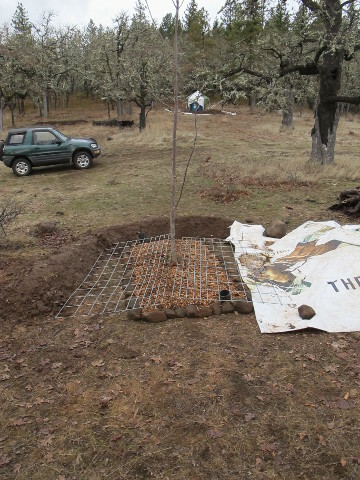 The result will be a water-retentive nutrient base for the tree that will be Chris’ memorial. 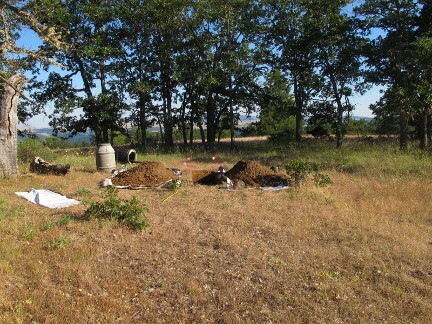 When doing a natural burial, we are happy to include family and friends to the degree that want to be involved. In this case, Chris’ sons took a hand at adding more chips to the grave. 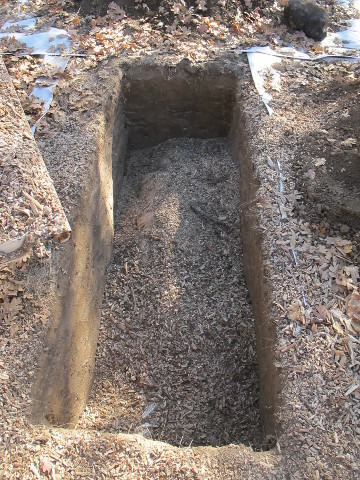 Once the remains are covered with a foot of woodchips, another foot of dirt was added to cap the grave. Then the next step is to plant a tree. Chris’ had wanted a female ginkgo tree, but they’re difficult to find because the commercial tree nurseries grow the male tree. The female ginkgo is not generally sold because homeowners and maintenance crews don’t like to have to clean up its fruit. That’s not a problem in the Herland Forest because the animals will be happy to take on that task, and what they don’t eat, will decompose back into the soil. 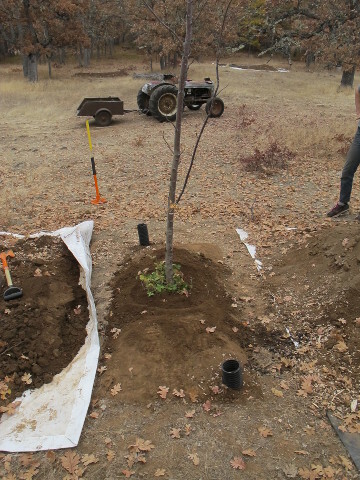 Accordingly, we went with a beautiful, tall chestnut, but in the coming year, we’ll be looking to find a female ginkgo. If we find a suitable tree, we’ll relocate this chestnut, and replace it with the ginkgo that Chris wanted. 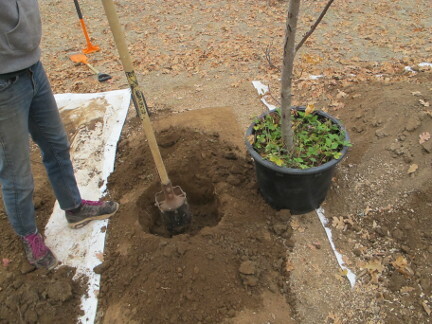 The next step was to put watering tubes in place so that the wood chips could be recharged with water in late summer. The goal here is to practice deep watering so that the tree’s roots will reach down deep. Surface watering encourages the growth of superficial roots, which isn’t good since that won’t help sustain the tree during the dry months of late summer. Deep roots will. The bouquet of green at the base of the tree is a half-a-dozen of the wild strawberries plants that grow throughout Herland Forest. 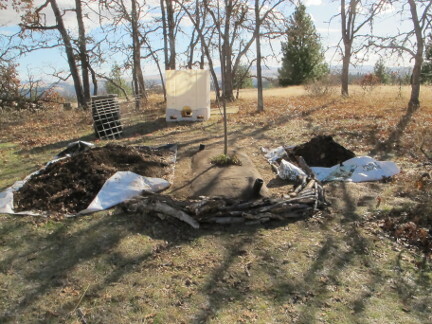 For the next few years, as the tree gets established, the watering tubes will allow us to recharge the woodchip “water battery” under the tree. To do that, we’ll be using water stored in a 300 gallon tank that we place just uphill from the grave. The open top tank will collect rain and snow over the winter, and then in August we’ll transfer the water to the grave to enable the young tree to use the late summer heat to spur its growth. 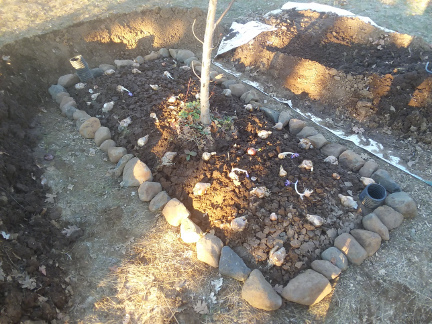 The next step involves transforming the grave into a bouquet of daffodils; here’s a pic of the bulbs laid out for planting. We really like daffodils, and take great joy in how they herald the arrival of spring, but there’s also a practical dimension. Herland Forest has lots of ground rodents who love to burrow into disturbed earth and transform it into a sort of Squirrel Condominium. The problem there is that tunnels contribute significantly to drying out the soil under a tree, which can make it very difficult for a new tree to make it through the dry season. The rodents also like to snack on the tender roots of young trees, which also jeopardizes a transplant’s likelihood of survival. Daffodil bulbs and roots are poisonous to mammals, so the squirrels stay away from the grave and find some other place to set up their burrows. The use of daffodils to protect against the squirrels is an example of how the stewards of Herland Forest work to maintain the forest without resorting to the use of commercial pesticides. The last step for now involves laying down a set of cattle panels to cover the grave. There’s lots of animals that live in the Herland Forest, and so we emplace a metal grid to make sure that the remains aren’t disturbed. We’ll remove the grate in the spring when the daffodils start to come out. One last pic as the first snow of the fall settles Herland Forest into a quiet winter’s nap. 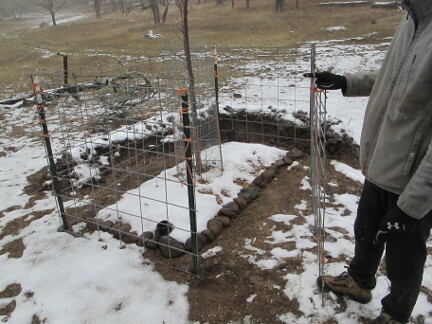 The final step in getting the grave ready for winter involves taking steps to protect Chris’ tree. The natives referred to February as “the starving moon” because it was a time when all creatures became desperate to find something to eat. In the early winter, the Herland Forest has lots of acorns to sustain the deer, but before the end of winter, the acorns will all be gone. Then, the temptation for the deer to strip the bark off of young trees will be powerful. So we install a double barrier to keep the browsers away.